I have just one question after watching Wednesday night’s first presidential debate in Denver: What did the Obama campaign do with the real President Obama? Who was that guy on stage exactly? Was that the Obama impersonator from Saturday Night Live? Where was the articulate and confident Obama? Was it the altitude or on a more serious note, was President Obama exposed and schooled by a very knowledgeable, confident businessman? Put it this way: If this was boxing match, the referee would have stepped in and stopped it. TKO Romney. The president seemed discombobulated throughout this 90-minute affair in Denver. He seemed to never be able to connect a few thoughts. I lost track after he went off on tangent number 18. How many tangents did he end up having? At one point, he even said to moderator Jim Lehrer, “You may want to move onto another topic.” Say what? Look, he’s never been the best debater in the world but this rose (or sank) to another level. With all due respect to the president, at times it looked like Mitt Romney was the president and Barack Obama was the overmatched challenger. I suspect things will change a bit in the next two debates but Mitt Romney sure did make a great first impression for voters who might be tuning in seriously for the first time. This wasn’t just about President Obama’s poor debate performance. It was equally about how strong Romney looked from start to finish. First of all, he was crisp, with command of all of the issues. He looked comfortable and even jovial at times and he was able to effectively weave some personal stories from voters on the campaign trail. It was the perfect mix of policy and personal stories. 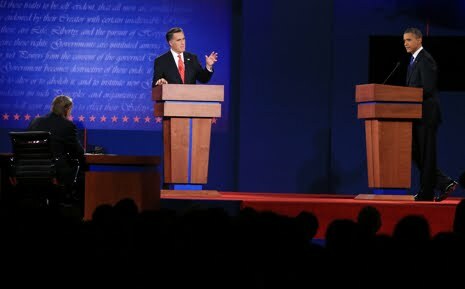 In addition, Romney hit it out of the park at the end of the debate when he provided a simple yet clear definition of the role of the federal government. It was a sweeping optimistic view of America, citing the Constitution and the Declaration of Independence. I was waiting for balloons to come down from the rafters and the Founding Fathers to greet Romney on stage. Romney was hitting on all cylinders. President Obama was driving a Yugo. Was the debate a game changer? It’s hard to say because you never know what will transpire in this next month. But what is clear is that Romney proved he could take it to President Obama and has taken a giant leap towards 1600 Pennsylvania Avenue.